The Global Leadership Council (GLC) of the World Evangelical Alliance's Mission Commission (MC) is pleased to announce that Rev. David Ruiz has been appointed as new Executive Director of the MC. He succeeds Dr. Bertil Ekström who has led the MC for the past ten years and is passing on the leadership after serving two full terms. “We are immensely grateful to Bertil for the way in which he has led the WEA MC since 2006. He took on the role during a time when there was much change in the world and the Church. He has built an excellent team and fostered national mission initiatives around the world. As a great relational leader, he led the MC to host a number of Global Mission Roundtables where global and regional leaders could come together to listen, deepen friendships and discern what the Lord was saying to His Church regarding the mission of God,” said Peter Tarantal, Chair of the GLC. When Dr. Ekström took office ten years ago, one of his first initiatives was to form a leadership team that has grown continuously and currently consists of nine leaders from five continents. The MC has also seen significant growth in its number of associated members, particularly with mission leaders from the Global South. Several new task forces have been launched focusing on business, stewardship, arts, technology and more, and twelve external mission-focused networks have ‘docked’ to the MC as partners. The MC has also produced a number of mission resources, including award-winning books such as Sorrow & Blood: Christian Mission in Contexts of Suffering, Persecution and Martyrdom. Rev. Ruiz will officially assume his new role in January 2017, serving a term of five years. Born in Guatemala, David began his professional life with a career in business administration and marketing before entering ministry and being ordained by the Centro Bíblico El Camino, Guatemala in 1990. He has since served in a variety of mission-related roles, including International Coordinator of the Great Commission Roundtable (GCR), Executive Director and International President for the Cooperación Misionera Iberoamericana (COMIBAM) and Associate Director of WEA’s Mission Commission since 2006. He was also part of the planning team of Lausanne’s Cape Town Congress in 2010 and continues to serve as Vice President of Global Ministries for Camino Global and Vice Chairman of the International Council of Interserve. He is also author and co-author of a number of mission-focused publications and resources. David holds a Master of Arts Degree in Contemporary Mission Studies from All Nations Christian College, UK. He is married to Dora Amalia and together they have three adult children. 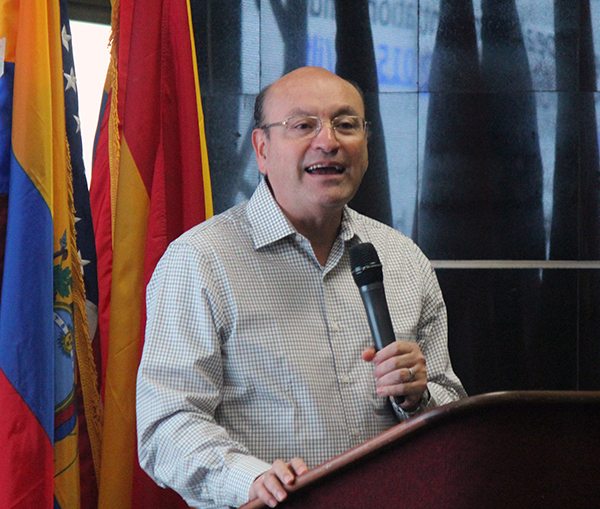 Picture Caption: David Ruiz speaking at WEA’s International Leadership Forum 2015 in Tegucigalpa, Honduras. The Mission Commission aims to inspire, advocate and strengthen God’s mission agenda among the global Christian community. The Mission Commission Associates (MCA’s) serve, catalyze and facilitate global missional affinity clusters for greater effectiveness, developing strategic relationships and resources. More information is available at mc.worldea.org.